December first! There are only 24 more days until Christmas and I’m just sharing my first holiday recipe with you! As usual, I am so behind but it’s not like that is much of a surprise considering I seem to say that every.single.year. At least I’m consistently behind on sharing holiday recipes, right? Anyway, it coincided perfectly that theme for Fill the Cookie Jar this month was Christmas/Holiday cookies. Fill the Cookie Jar is hosted by Cynthia of Feeding Big and it’s a monthly blogging event where home bakers get together and share their favorite cookie recipes based on an assigned theme. Peppermint is one of the few ingredients I love that Tom doesn’t like at all. Which means anytime I make something with peppermint it’s ALL MINE! Unless I decide to share it with my coworkers (which always happens) who love peppermint as much as I do. It should be no surprise that I chose to start off my holiday baking with a peppermint recipe. 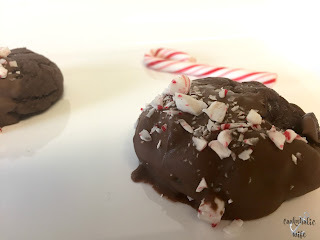 If you love chocolate and peppermint, you’re going to love these chocolate dipped peppermint cookies! 1. Preheat the oven to 350 degrees. Line two large baking sheets with parchment paper. 2. In the bowl of a stand mixer combine cake mix, butter and eggs. Beat on medium speed until combined. 3. Stir in the chocolate chips and peppermint extract until combined. 4. Use a cookie scoop to scoop out dough and place 1-2 inches apart on the prepared baking sheets. 5. Bake for 13-15 minutes or until puffy and no longer glossy. Transfer to a wire rack to cool. 6. Meanwhile, place the chocolate almond bark or chocolate chips in a microwave safe dish and microwave in 30 second intervals, stirring after each until melted and smooth. 7. 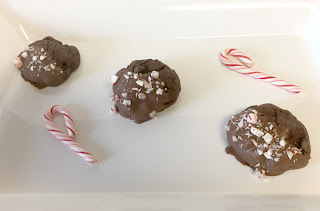 Dip half of the cookie into the chocolate and sprinkle with the crushed candy canes. Return to the parchment paper to allow to chocolate to set. Repeat with remaining cookies. 8. Cookies will keep for 1 week in an airtight container. I went light on the peppermint extract because it is one of those flavors that can easily overwhelm a dessert, but I think I could have increased this to 3/4 of a teaspoon. 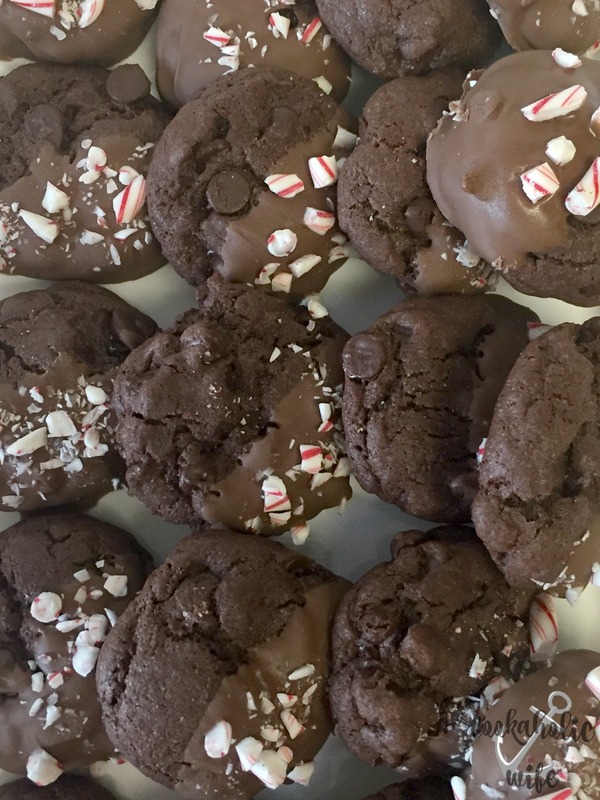 The cookies are light and airy and full of chocolate flavor. The peppermint shines through nicely in the cookie and the crushed up candy canes gives a crunch to an otherwise soft cookie. I already know these cookies will be devoured! I love chocolate peppermint cookies! I make them about every other year. I'd make them every year but there are so many cookies out there- so little time. KWIM? I love peppermint Nichole and these sound absolutely wonderful. Don't you just love when a cookie, or any treat for that matter, becomes all yours! These sound delicious! 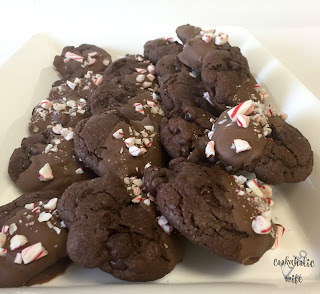 This is my favorite cookie, chocolate and peppermint! This speaks to most everyone in the crowd this time of year. SO much chocolate! Those cookies look divine. It's hard to believe someone does not like peppermint! It's one of my favorite flavors, especially this time of year! Just more beautiful cookies for you! These sound decadent! I know my dad will love these cookies. 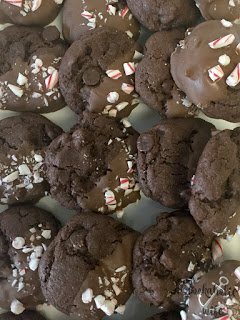 Peppermint and chocolate together, my favorite and a perfect cookie to start Christmas season off. These would be awesome with a tall glass of cold milk.